The libssh library is implementing the SSH protocols and some of its extensions. 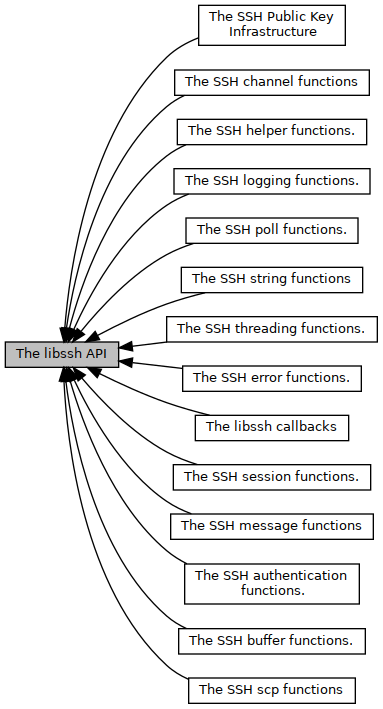 This group of functions is mostly used to implement an SSH client. Some function are needed to implement an SSH server too. This function is automatically called when the library is unloaded. 0 on succes, -1 if an error occured. Since version 0.8.0, it is not necessary to call this function, since it is automatically called when the library is unloaded. If ssh_init() is called explicitly, then ssh_finalize() must be called explicitly. When called, decrements the counter _ssh_initialized. If the counter reaches zero, then the libssh and cryptographic data structures are cleaned up. Since version 0.8.0, it is not necessary to call this function on systems which are fully supported with regards to threading (that is, system with pthreads available). If the library is already initialized, increments the _ssh_initialized counter and return the error code cached in _ssh_init_ret.